The buttonbush is a deciduous, multi-stemmed shrub or small tree that produces flower heads. It is part of the coffee family (Rubiaceae). The shrub’s flower heads have tiny, tubular, white flowers that grow in a sphere shape. It looks like a pincushion. The flowers bloom from June to August. The flowers produce green and brown nutlets, which are ripe in the fall. They stay on the plant throughout the winter. Different animals, ducks, and birds eat this fruit – more than 50 species, in fact. Although, it is poisonous to humans and livestock. Hummingbirds, butterflies, insects, and honey bees feed off this plant’s nectar. This plant has dark green, glossy leaves that are two to six inches long and one to three inches wide. In the fall, the leaves turn light green or yellow. It can be found in forests, around ponds and streams, and swamps. This plant loves moist soils and likes mostly sunny areas. It can live in water up to three feet if flooding occurs. However, it does not tolerate salt water well. Many animals and ducks use this plant for nesting or for cover in the wild. This plant can grow 10 to 20 feet in the Everglades. If you love flowers and plants, you need to get out and explore the Everglades – there is no place like it on Earth. You need to see these beautiful plants up-close-and-personal! A great way to view flowers in the Everglades is on an airboat tour. Even if you don’t see a buttonbush, there will be so many other flowers, plants, and wildlife you will see and learn about on your trip. If you’re ready to explore the Everglades, jump on a private airboat tour! 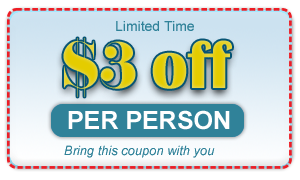 You’ll have a fun day full of exciting memories to share. To book an airboat tour, call Captain Mitch’s Airboat Tours at 800-368-0065 or click our Private Everglades Airboat Tours page. Cacti in the Everglades? Huh? I thought cacti grew in deserts. They do, but they also thrive in tropical and subtropical environments. In fact, there’s many species of cacti that are native to the Everglades. These cacti enjoy the heavy rainfalls in the Everglades, as well as the sunny and hot days. These cacti like the sandy, rocky, alkaline soils found throughout the wetland. In the Everglades, the cacti species Simpson’s applecactus (Harrisia simpsonii) lives but is endangered. This cacti is large and has white, fragrant flowers that bloom at night. It’s nickname is “Queen of the Night.” Bats, moths, and other insects are attracted to these flowers because of their sweet smell and help pollinate the cacti. 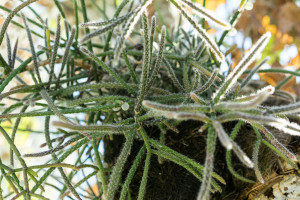 Another endangered cacti in the Everglades is the mistletoe cactus (Rhipsalis baccifera). Sadly, it has not been spotted in the park since 2005! The last-known mistletoe cactus was destroyed by a hurricane. The triangle cactus (acanthocereus tetragonus) is a large cactus that can grow up to 23 feet in height. It has white flowers that open around midnight and close at dawn. It produces two-inch, red fruit. The Everglades is the perfect location for you to get a view of so much different plant life, including cacti. On an airboat tour, you’ll have the opportunity to see so many plants and flowers. Even if you don’t see a cactus, there will be so many other plants you will see and learn about on your trip. If you’re ready to explore the Everglades, do so by airboat! It’s a fun adventure! To book an airboat tour, call Captain Mitch’s Airboat Tours at 800-368-0065 or click our Private Everglades Airboat Tours page. The coral bean is a native flower plant to the Everglades. It blooms from spring until fall. It has red, tubular flowers that attract butterflies and hummingbirds. In the fall, its seed pods mature and turn nearly black. These seed pods split open to reveal red seeds inside. The coral bean’s seeds are poisonous. During the winter, it freezes to the ground. In the Everglades and South Florida, this flowering plant grows as a large deciduous shrub or small tree while in North or Central Florida it grows as a large perennial; it can grow up to six feet tall. This plant is beautiful when it flowers, but it’s actually not that attractive of a plant when the flowers are gone. It is known to look sparse and ragged. Coral bean thrives in well-drained, sandy soil with full sun or a little shade. It is a salt-tolerant plant. If you boil the flowers and young leaves, they are edible. The coral bean flower has six antioxidants in it, so it is healthy. The plant tastes like mild spinach. Remember, the seeds are not edible. In fact, in Mexico, the seeds are used to poison rats and fish. This plant always turns its leaves towards the sun. This plant is also known as the Cherokee Bean. There are so many reasons why the Everglades is a beautiful and magical place. One of these reasons is the flowers. Pictures don’t do the Everglades’ plants and flowers justice. You must see it in person to truly grasp the beauty. A great way to view flowers in the Everglades is on an airboat tour. 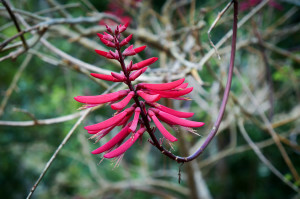 Even if you don’t see a coral bean, there will be so many other flowers you will see and learn about on your trip. If you’re ready to explore the Everglades, do so by private airboat! It’s an experience you’ll never forget. To book an airboat tour, call Captain Mitch’s Airboat Tours at 800-368-0065 or click our Private Everglades Airboat Tours page. What comes to mind when you think of a succulent? A pretty, little greenish-blue plant that lives in a tiny pot in your house? Succulents in the home is popular at the moment. However, many succulents are actually native to the Everglades. Agave decipiens can be found around beach dunes and shell mounts. It is a bright-green succulent with spiny leafy margins. 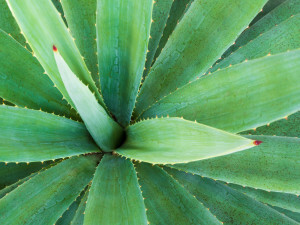 Tequila, mescal and other drinks have been derived from the Agave. Sisal hemp (a. sisalama) has good fibers in it that is great for making clothing and rope. Wormvine vanilla (Vanilla barbellata) never touches soil and has a few tiny leave and thick succulent stems. Their stems are an orange hue when conditions are harsh. They produce beautiful flowers. They are found in coastal forests. Shoreline seapurslane (Sesuvium portulacastrum) is a herb that grows in coastal prairies and beach dunes in the Everglades. It has thick, fleshy leaves with succulent, reddish/green stems. This succulent grows up to 12 inches with some stems growing up to three feet. It produces pink flowers. It helps beach erosion by catching sand in its roots. If you’re a fan of succulents, you’ll love spotting them in their native habitat. The Everglades is packed with plants and flowers for you to enjoy. Many of these species you won’t get to see anywhere else. 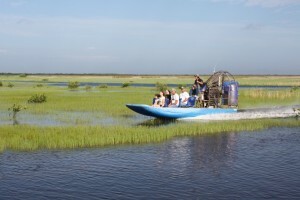 A great way to take in all the plants in the Everglades is on an airboat tour. Even if you don’t see a succulent, there will be so many other plants you will see and learn about on your trip. If you’re ready to explore the Everglades, do so by private airboat! It’s a fun adventure! To book an airboat tour, call Captain Mitch’s Airboat Tours at 800-368-0065 or click our Private Everglades Airboat Tours page. If you’ve spent some time in Florida, you’ve probably run into the Muscovy duck. These are ducks with attitude! They aren’t really scared off by humans and you’ll often see them on sidewalks or streets. When they see you coming, they won’t move, because they expect you to move around them! With their bold, aggressive attitude and bigger body, they are not your average duck. They also are not native to Florida or the Everglades, which makes them an invasive species. The Muscovy duck was seen in Florida as early as the 1960s. These ducks are native to Central America and South America. This duck ended up in America by both escaping and being released, illegally, which continues to happen. Muscovy ducks are mainly black with some white and red coloring throughout their feathers. This breed of duck has the potential to transmit disease and interbreed with Florida’s native ducks and other waterfowl, which makes it a threat to the native species. It is illegal to release this duck in the state of Florida because they can spread diseases and breed quickly. Many people who encounter these ducks do not like them because they are known to be aggressive, damage property, and leave droppings all over yards, sidewalks, driveways, and roads. They breed around lakes and farms. Muscovy ducks eat seeds, insects, plants, grasses, aquatic plants, and food from humans. They may be a non-native aggressive species, but a lot of people actually like the Muscovy ducks too, and don’t mind them roaming their neighborhoods. 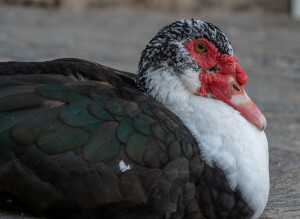 The Muscovy duck is just one of many species of birds living within the Everglades. On an airboat tour, you will get to see so many birds flying or swimming by. Come on an airboat tour and be close to nature! It’s a once-in-a-lifetime experience to be surrounded by beautiful creatures and plant life. To book an airboat tour, call Captain Mitch’s Airboat Tours at 800-368-0065 or click our Private Everglades Airboat Tours page. The National Academics of Sciences (NAS) wants a re-assessment on the current work being done to restore the Everglades. The NAS committee wants to ensure that all the projects are involving climate change and its impacts. Currently, the NAS committee is assigned to monitor the restoration project. The Comprehensive Everglades Restoration Plan (CERP) is trying to remove 240 miles of canals and levels to restore the sheetflow of water to how it was historically. This restoration is about restoring the livelihood of the entire ecosystem that will benefit the plant life, wild life, and human population. NAS does not believe the current project/plans consider the effects of climate change. The committee believes you need to plan and design around climate change, sea-level rising, rising temperatures, and changes in rainfall in order to have a successful restoration plan. The committee wants a more rigorous analysis of the effects of climate change on restoration outcomes in order to plan so whatever is done is more resilient. Below, are 5 components of Everglades Restoration that were put together in 2007 by the Committee on Independent Scientific Review of Everglades Restoration Progress. Creating enough water storage capacity and appropriate volumes of water that make healthy estuaries and bring the return of sheet flow. Bringing the water back to its natural flow patterns, volume, depth, velocity, direction, etc. Creating barriers so that higher water levels can be maintained in the Everglades. Creating methods for securing water quality conditions. Retaining, improving, and expanding habitats by protecting lands. One of the biggest challenges the restoration faces is funding, but the hope is that the more we feel and see the effects of climate change and sea levels rising, more people will realize it’s important to restore the Everglades as quick as possible. Overall, the committee wants the Everglades Restoration to be prepared for all climate changes in the future. It’s important to restore the Everglades. If not, the wetland will shrink and disappear. Animals and plant species will also disappear, as well, if we do not take care of this area. At Captain Mitch’s Private Airboat Tours, we respect the Everglades and want it to be a part of our lives forever and for future generations. Come on down and check out the beautiful Everglades on an airboat ride. It’s a once-in-a-lifetime experience. To book an airboat tour, call Captain Mitch’s Airboat Tours at 800-368-0065 or click our Private Everglades Airboat Tours page. The Everglades is home to 100 species of seed-bearing plants and 120 species of trees. In fact, there are more plants found in the Everglades than anywhere else in the world. However, some of these species are not native to the Everglades and can cause problems to the native species. 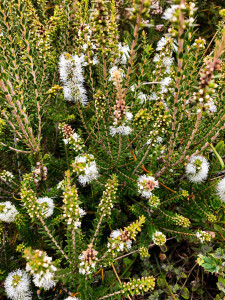 For this article, we wanted to share with you some information on the invasive plant: Melaleuca quinquenervia. The melaleuca is known as the paperback or punk tree that is part of the eucalyptus family. It is originally from Australia, New Guinea, and the Solomon Islands. The tree was brought to southern Florida in the early 1900s for landscaping purposes and swamp drying. This tree has spongy, white bark that peels. It can grow up to 80 feet tall. Its leaves are green and are about two to six inches in length. The tree produces white flowers and small fruit/seed capsules. Unfortunately, the melaleuca aggressively invades and spread rapidly. It can turn marshes and wet prairies into thickets. An adult tree can produce more than a million seeds per year and store 20 million seeds. The seeds get released if there is a frost, fire, or herbicide application. This plant is one of the greatest threats to the Everglades’ ecosystem. Researchers, officials, and park workers are working to get this tree out of the park. Young trees can be pulled out by hand, medium trees can be pushed over, and larger trees are cut down. Due to lots of seeds being spread around, follow-up removal or herbicide treatment is required. The U.S. Department of Agriculture is trying to see if the snout beetle will be worth using in the fight against the melaleuca. This type of beetle is known to feed on the melaleuca’s shoots, which keeps it from reproducing. Herbicide is currently used for a largest infested area, but it can cause the tree to release its seeds, which makes the problem worse. Problems in the Everglades go well beyond the Burmese Python. As you can see, other invasive species are threatening the ecosystem. We thank the park workers, scientists, researchers, and officials, who are working on managing and eliminating all threats to the Everglades’ livelihood. We want the Everglades to be here for many generations ahead. Like stated above, the Everglades is full of plant species (many native), and they are beautiful to see in person. A great way to view the plant life and Everglades is on an airboat. To book an airboat tour, call Captain Mitch’s Airboat Tours at 800-368-0065 or click our Private Everglades Airboat Tours page. It isn’t easy being the Everglades right now. The beautiful ecosystem has been struggling as it combats human development, pollution, invasive species, and climate change. To add more fuel to the fire, the Everglades need more freshwater. Why? Due to rising sea levels, the Everglades has been filled with higher salinity in its waters, and more saltwater in the area could make things worse. 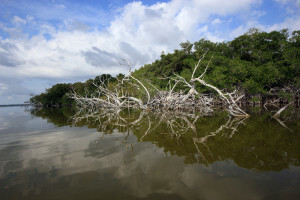 When the salinity is high in the water and water levels are low, the Everglades releases up to three times the amount of carbon dioxide than it should, according to scientists at FIU. The peat soil in the Everglades traps carbon dioxide when the water is high. Saltwater can cause the peat soil to break down, which is when the carbon dioxide gets released. According to FIU, the amount of carbon dioxide being released from the Everglades when saltwater hits the peat soil is comparable to 35,000 cars emitting carbon dioxide in one year. The increased salinity in the Everglades water has been killing plant roots in fresh water and brackish water marshes. In fact, 65 percent of plant roots in the fresh water marshes and 72 percent of the roots in brackish waters have died because of the increase in saltwater, which is due to the seal level rising. 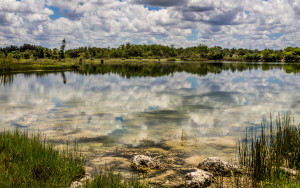 FIU is able to study the effects of saltwater in the Everglades thanks to a Florida Sea Grant and the Florida Coastal Everglades Long Term Ecological Research (FCE-LTER) program. Thanks to the work of researchers and scientists, the Everglades is being monitored, watched, and renovated to return to a state in which is can thrive. The Everglades is a beautiful place, we have been air-boating through its waters for decades and we’re hoping to for many years more! 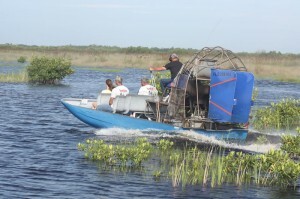 At Captain Mitch’s Private Airboat Tours, we respect the Everglades with everything we do. Come down and check out the beautiful Everglades on an airboat ride. To book an airboat tour, call Captain Mitch’s Airboat Tours at 800-368-0065 or click our Private Everglades Airboat Tours page.